* 6 Cylinder engine * * Check out this 2017 Honda Pilot Touring * * 2017 ** Honda * * Pilot * It comes with a 6 Cylinder engine. Flaunting a sleek gray exterior and a gray interior. View this beauty and our entire inventory today! Call for more details. Meridian Honda the best cars... The Best Experience. Your hometown Honda dealer servicing Meridian, Forest, Jackson, Birmingham, Philadelphia and Hattiesburg. 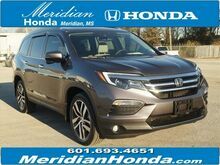 * 6 Cylinder engine * * Check out this 2017 Honda Pilot Elite * * 2017 ** Honda * * Pilot * This Grey 2017 Honda Pilot Elite might be just the SUV AWD for you. It comes with a 6 Cylinder engine. Flaunting a beautiful grey exterior and a gray interior, this car is a sight to see from the inside out. Don't sit on this decision for long...schedule your test drive today! Meridian Honda the best cars... The Best Experience. Your hometown Honda dealer servicing Meridian, Forest, Jackson, Birmingham, Philadelphia and Hattiesburg.